Paonta Sahib: The 2nd Annual Convocation of the Indian Institute of Management Sirmaur was held on 13th April, 2018. The ceremony was held in Paonta Sahib, at the Institute’s interim campus. Shri Jai Ram Thakur, Chief Minister of Himachal Pradesh was the Chief Guest on the occasion and delivered the Convocation Address. 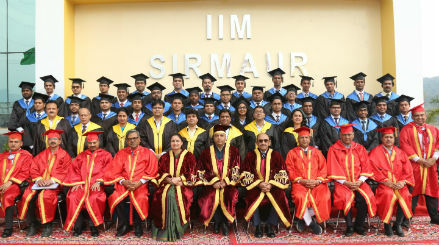 The ceremony was also graced by Shri Ajay S. Shriram, Chairman and Senior Managing Director, DCM Shriram Ltd., and Chairman of the Board of Governors, IIM Sirmaur, who delivered the welcome address and awarded Degrees to the graduating students. This is this first batch of students who received the MBA degree instead of the Post Graduate Diploma in Management. The decision to award degrees instead of diplomas was taken earlier this year as per the provisions of the IIM Act 2017. In all, 35 students were awarded Degrees. Padmanav Adhikari received Chairman’s Gold Medal for being the topper of the batch. Director’s Gold Medal was awarded to Lalatendu Panda for ranking second in order of merit in absentia. In addition, Soumyadeep Das was presented with Director’s Special Recognition Award for being the “Best All Rounder” and Arushi Singh was awarded Director’s Special Recognition Award for being the “First and Only Girl Student” in her batch. In his Convocation address, the Chief Minister extended hearty congratulations to the graduating batch and underscored the significance of an institute of national importance such as IIM Sirmaur for Himachal Pradesh. He said that it is a matter of great pride for Himachal Pradesh that the IIM Sirmaur community is thriving in Paonta Sahib despite challenges. He assured the full support of his government toward IIM Sirmaur, especially in regard to the development of its permanent campus at Dhaula Kuan. He urged the graduating batch to remember their educational roots in the district of Sirmaur and contribute toward the betterment of the state of Himachal Pradesh in any way they can in the future. He acknowledged the great impact of parents and teachers in the lives of students and urged the future leaders to retain strong links to their culture and values. In his welcome address, Shri Ajay S. Shriram acknowledged the immense contribution and concerted effort required by all stakeholders to build a world renowned institution. Citing the IIM Act 2017, he stated that the onus is now on the Board of Governors to go the extra mile to ensure the continued growth of the institute. Speaking about the upcoming permanent campus of IIM Sirmaur in Dhaula Kuan, he said that close coordination with a large number of agencies is required to build a world-class futuristic campus that aims to preserve the essence of Himachal Pradesh. He urged continuing active engagement with the state government and expressed his great pleasure that the presence of the Chief Minister indicated the support of the Government of Himachal Pradesh. For the graduating students, he gave three principles for success: strong value system, open mind, and building a strong team of committed people. He advised students to develop high ethical standards and take the initiative to learn throughout their lives. IIM Sirmaur became operational in 2015, and only in a short while, it has introduced several measures to distinguish itself. From 2018, students will have the opportunity to earn international credits. The curriculum has also been redesigned to include further integration of blended learning modules in existing courses, and new courses on entrepreneurship, data sciences and communication. Furthermore, all courses at IIM Sirmaur include up to 20% of teaching by industry practitioners to ensure greater industry collaboration and integration in the process of academic learning. In addition, IIM Sirmaur is also incubating five ventures initiated by women entrepreneurs for a year, vide an MoU with the NS Raghavan Centre for Entrepreneurial Learning, IIM Bangalore. With these new initiatives, IIM Sirmaur is working to enter and build the start-up ecosystem in the region and give students a 360 degree application-oriented learning experience.